Craving a crusty specialty pizza by the Pacific Ocean? Wade through a sea of shoppers and head to the third floor of Santa Monica Place to experience where locals and visitors feed their pizza cravings, Pizza Antica. Laid-back and casual, Pizza Antica’s beachy design boasts a spacious dining room with high ceilings flanked by cool surf-inspired black and white photographs by local artist, Ed Anderson. Sit outside on the patio to enjoy fresh sea breezes while you chow down or grab a table inside or by the bar. A wide selection of red and white wines, draft beers, and natural teas quench your thirst while perusing the mouthwatering menu. Order a delicious starter like artichoke hearts or opt for a crunchy chopped salad atop a piadini, an addictively tasty thin Italian flatbread. Tantalizing pizza choices await–the spicy fennel sausage, portobello mushroom, and onion pizza hits the spot or feel free to build-your-own pizza with yummy toppings like pancetta, arugula or pesto. Meat lovers can indulge in glorious main dishes like boneless short ribs with creamy polenta and rapini or perfectly roasted lamb chops with ceci (chickpeas) and olives. Lip-smacking desserts include panna cotta with huckleberry sauce and rhubarb crisp with strawberry gelato. Suffer from gluten allergies? 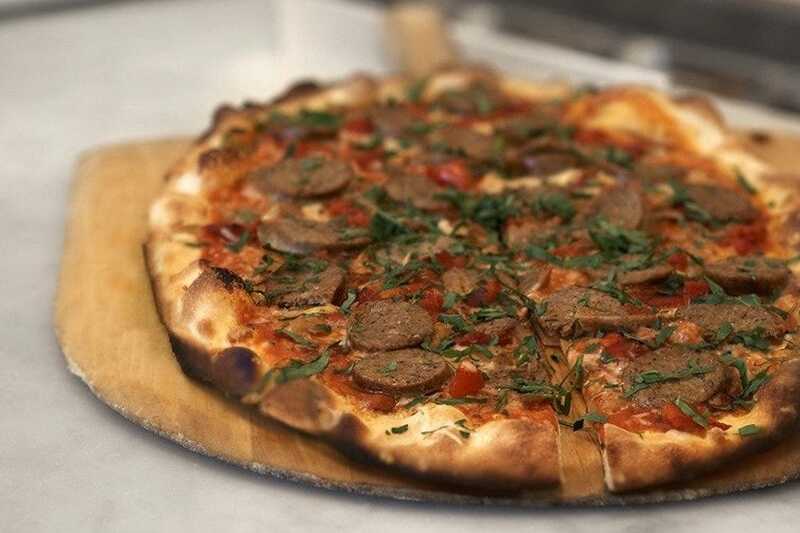 Not to worry because Pizza Antica provides an extensive gluten-free menu complete with gluten-free pizza dough and pasta. Pizza Antica is the perfect place to dine with family and friends after a sun-soaked day at the beach or window-shopping the Third Street Promenade. A pizza lover 'til the end of time, Sujata Day is on a quest to frequent every pizza place in Los Angeles.